Some listing agents leave cute notes around the house, highlighting features. Some sellers bake cookies. And then there's this listing agent. I'm about as analytical as it gets. In business lingo, it's part of my "value-add" and given my background, a competitive advantage. Yet despite my hard nosed perspective on valuation, I'm affected by the sweet, cozy smell of fresh baked cookies. It's warm and inviting. It makes me think of grandmothers and childhood. I want to linger. This sign isn't warm and friendly. It's certainly not a "Special Feature." It makes potential buyers feel like they're invading the seller's privacy and that the seller doesn't trust them. Trust is critical for negotiation. It's not just about making people feel good. 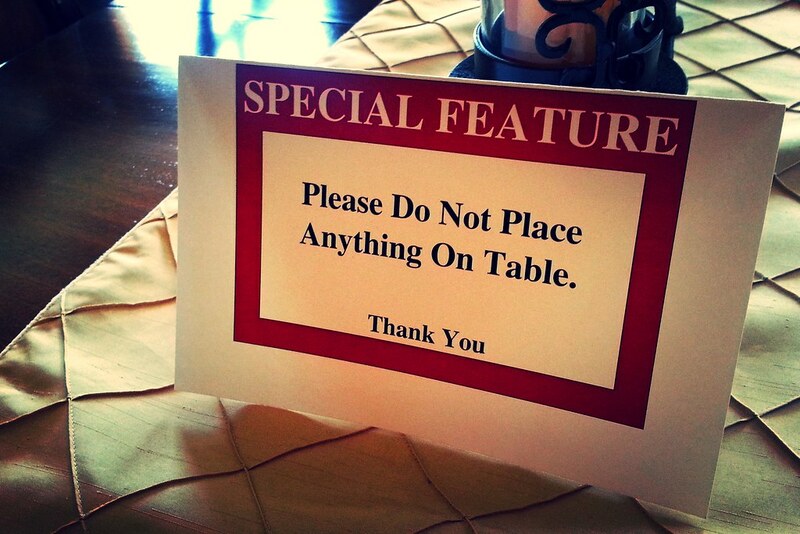 If you want people to not place things on the table, try a cute sign and maybe a little explanation.